Our long history of window replacement services in DeKalb and familiarity with custom window replacement products will ensure your DeKalb window replacement job is completed on time. DeKalb homes are just as unique on the outside as they are on the inside. A window replacement from Ken Spears Construction of Genoa will create more natural sunlight and make your Dekalb home an even warmer and inviting place. From modern window replacements to finding the perfect window replacement for deteriorating frames, our certified window replacement specialists are here for you during the whole job. We’ve completed every type of window replacement project in DeKalb, including triple pane glass window replacement, vinyl blind window replacement, antique window replacement, and patio door window replacements. A window replacement job from Ken Spears Construction in Genoa is of unrivaled quality and craftsmanship. 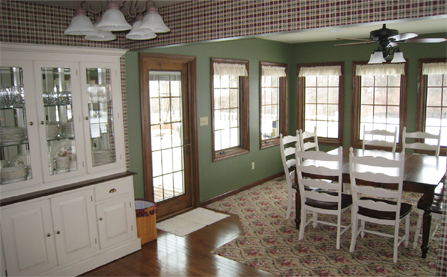 Our custom window replacements will enhance the charming atmosphere of any home. Our team will come into your house, decide the proper type of window replacement, and keep the entire window treatment job within your budget.